The team from HKA Tech, the largest implementing reseller of PMWeb globally, has been busy in the Fiji Islands, implementing PMWeb for the Fiji Government’s Ministry of Economy. Kanban is a visual system for managing work as it moves through a process. Kanban visualizes both the process (the workflow) and the actual work passing through that process. We are pleased to be able to report that the Chinese Government have been translating the Guild of Project Controls' Compendium of Best Tested & Proven Practices and plan to have their very first COMPETENCY certification in Project Controls in Beijing on 29 June 2019. Watch this space for more exciting news in relation to this. In support of better project file organization in the EPS, P6 EPPM has several node band themes to choose from. Facilitating secure sharing and control of confidential data in P6® schedules. ScheduleCleaner is a toll that allows users to remove or anonymize sensitive data from Primavera® P6®, XER schedules before sharing them with project stakeholders. Why not do the same when working with Microsoft® Project plans? A Microsoft® Project add-in that allows you to remove or anonymize sensitive data in .mpp files. PRIMAVERA TIP - MULTIPLE CRITICAL PATH IN A SCHEDULE? With all that goes into managing a project, making sure things are done right, within budget, and on time is a challenge; especially when we fall victim to the same mistakes. Using the new customizing dialog, users can change the criteria for all (previously predefined) fourteen metrics calculated in the report. 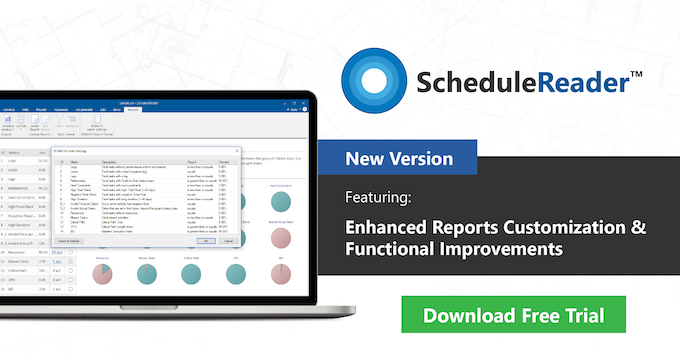 Users can now additionally see which project metrics are positive as well as the details of the activities and relationships that do not meet the set criteria in the specific report. The most intuitively obvious enhancements are to scheduling metrics: critical path drag and drag cost. Let’s start with an important distinction: there is a difference between CPM scheduling and critical path analysis - Read the article. Management of Variations and Construction Claims Course, is up and running and ready for action. Go ahead and check it out. Advanced Management of Complex Changes and Claims in Construction - 2 DAYS, is up and running and ready for action. Go ahead and check it out. Alternatively - join us for a live and interactive webinar on April 24th at 10:00 GMT. The Webinar is aimed at project controls professionals looking to distinguish themselves by adopting forward-thinking practices - read more. Spider Project offers numerous unique functional features and is the only PM software that optimizes resource, cost, and material constrained schedules and budgets for projects and portfolios.